Our church is starting an Advent series about how the birth of Jesus impacted different people. This week is on Joseph, so I thought I’d get a head start on reading, thinking, visualizing the scenario for myself. Now the birth of Jesus took place in this way. Matthew decided to start his story not with Mary, but with Joseph. 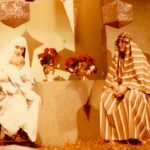 Joseph’s response to Mary’s pregnancy is a pivotal point. Jesus had to have a human father in order to be a son of David. When his mother Mary had been betrothed to Joseph, before they came together, she was found to be with child from the Holy Spirit. The facts: Mary is pregnant; Joseph knows it’s not his; they are engaged but not married; she was impregnated by the Holy Spirit. As incredible as the last one is, it is mentioned with the others. Joseph knew the facts, at least as they were told to him. I would have like to have been an ant on the wall during that conversation! And her husband Joseph, being a just and unwilling to put her to share, resolved to divorce her quietly. It’s a little confusing, but he was considered her husband while they were engaged. I’m not a scholar and not sure what this looked like, but her unexplained pregnancy seems to be akin to adultery. But Joseph believed her story, that it was not adultery. He wasn’t completely sure what it was and he wasn’t sure what his part would be. So he turned to social convention. What do you do in a case like this? Obviously, it had never happened before. He wanted to do the right thing, but wasn’t sure what that was? And after all, God hadn’t talked to him yet. He still loves Mary. He’s just so he knows something needs to happen. But he wants to do justice in the most loving way possible. There is a tension between justice and love. Lord, help me to temper my own need for justice with love. Help me to wrestle with what that means in my own life, in my relationships. Amen.